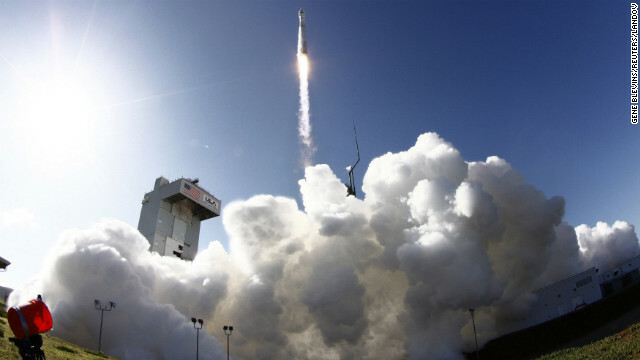 An Atlas-V rocket carrying a Landsat satellite lifts off Monday at Vandenberg Air Force Base, California. NASA put its newest Landsat satellite into orbit on Monday, extending a long-running program that has been beaming back dramatic images of Earth for more than 40 years. The Landsat Data Continuity Mission - to be designated Landsat 8, once it's up and running - lifted off from California's Vandenberg Air Force Base atop an Atlas V booster. The $855 million platform, about the size of a sport-utility vehicle, has been in the works for years amid concerns about maintaining the U.S. suite of geoscience satellites.